Revealing the variety of life underground, the bright comfort of a greenhouse on a winter’s day, or the anticipation of starting seeds indoors in early spring, this striking alphabet book celebrates the simple joys of gardening. Without neglecting the frustrations—the nibbling critters and the toil—or wry, humorous moments spent in the garden. Mary Azarian’s spare words and lovely woodcuts capture the essence of turning a bare plot of ground into fragrant flowers and lush vegetables and trees. 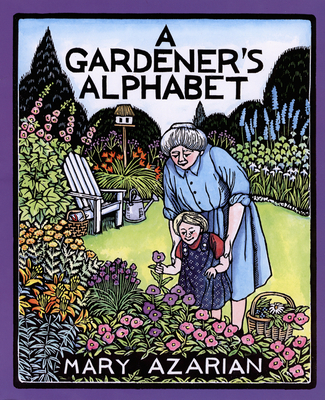 Her depictions of insects, manure, and compost piles are as delightful as her fountains, pumpkins, and Queen Anne’s lace. Whether we are young or old, our gardens both exhaust and renew us. They are our source of magic and wonder and perhaps our best way to live closer to the land and to the rhythm of the seasons. The stunning black woodcuts, hand tinted with strong watercolors, are full of action and detail, showing men, women, and child gardeners with their tools and the rewards of their labors, with small creatures visible here and there. Each page can inspire conversation between an adult and child who may then do some gardening of their own.